The seed is a well designed survival pod. During the seed stage, there is no significant growth. Instead, the living seed embryo inside uses energy very, very slowly...waiting for the right conditions. It may have to wait all winter! While the embryo waits, it uses its own special section of the seed for food. This is called the non-micropylar endosperm. A special area this food, called the micropylar endosperm, is left untouched all winter. When the time comes, this food will be used to fuel the initial growth of the tap root. 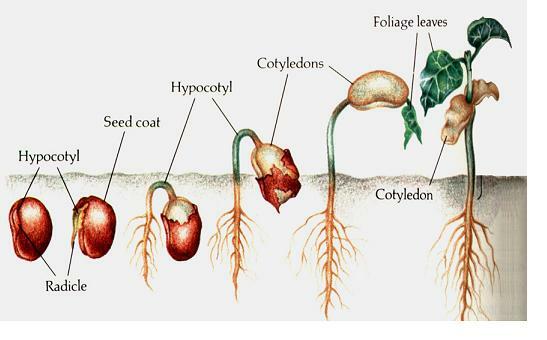 In spring, when the temperatures are right, the outside seed coat begins to absorb water and swell, until the seed pops open. As the embryo begins absorbing more water, the radicle stretches out into a tap root and the cotyledons stretch out to become leaves. This ends the seed stage and begins the seedling stage. Depending on the plant you are growing, the seedling stage may be only a few days long, or may take many months.